Through your efforts and initiative during your working years, you have accumulated assets– real estate, cash, stocks, bonds, retirement funds, personal property – which is your estate. Estate planning helps you thoughtfully consider and plan for preservation of your estate during your lifetime and provide for the orderly transfer of what you own after death. Estate planning can also help to minimize taxes, manage costs, avoid probate, insure that your heirs and survivors receive what you want and expect them to have, and also provide for lifetime management of your estate in the event you become incapacitated. In addition, your plan may include gifting to family or charities, providing care for a disabled child or spouse, special arrangements for a second marriage, protecting assets for minor or disabled children or providing a fund for education for the next generation. Sue has been certified by the Ohio State Bar Association as a specialist in Estate Planning, Trust and Probate Law. As your attorneys, Sandra and Sue will work with you to design a plan to meet your needs and the needs of your family through the years. Your Last Will and Testament has power only over those assets held in your name alone, which do not have a joint owner nor a designated beneficiary. 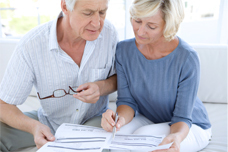 Many assets may bypass probate and go directly to joint owners or beneficiaries. Your Will names an Executor, who is the person you choose to be in charge of your estate. You should also name an alternate executor. Your Will directs distribution of your probate assets after payment of taxes, bills and expenses. You may wish to use percentages when directing distribution to multiple beneficiaries who are not to be equal beneficiaries. If a gift to a person or organization is a small gift such as $1,000, percentages would not be necessary. However by using percentages for larger amounts you assure that all of the beneficiaries you wish to benefit will receive something whether the amount left in your estate is large or small. Your Will can also direct specific gifts to charity, division of items of personal property, and care of your pets. The Durable General Power of Attorney is commonly used to give full, broad authority to another person to act in your behalf with regard to all matters related to personal financial or business affairs. The person that you choose to be your agent on the Power of Attorney is called an attorney-in-fact and should be someone who is completely trusted by you to act in your best interests. Unfortunately, the Power of Attorney is a document that has been subject to much abuse by persons who use them as an opportunity to benefit themselves. If you do not have a Financial Power of Attorney in place, the Probate Court will appoint a Guardian to handle your affairs and oversee every aspect of what the Guardian does in order to help protect you from the abuses that may arise in the use of a Power of Attorney which is not subject to any court oversight. The Medical Power of Attorney is most commonly referred to as a Health Care Power of Attorney in Ohio. This is a standardized form that is available free of charge to you through our website, your doctor, or hospital. This form designates another person to make medical decisions for you when you can’t. It is important for you to have this document in writing as with the new privacy laws (HIPPA) written authorization is necessary for access to decisions about medical matters. “The Living Will” is a document that expresses your wishes concerning life sustaining treatment when you are in a terminal condition. It is important for your family to know your decisions about these difficult end of life issues. The Organ Donor Registry form is an optional form that allows you to personalize your meaning of organ donation.